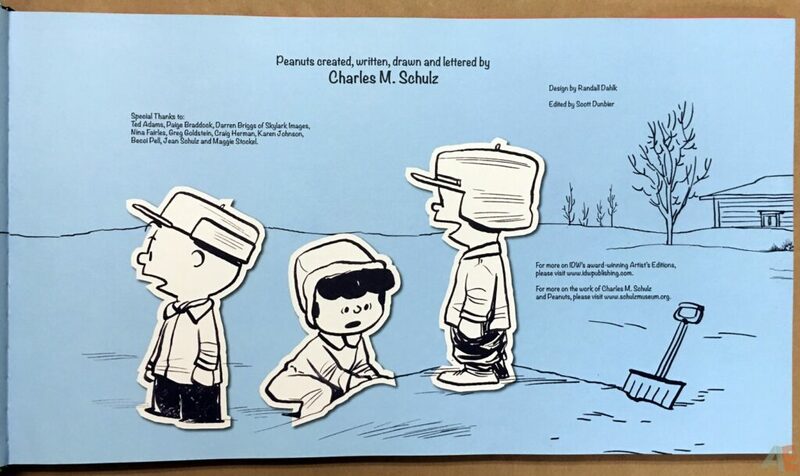 Charles Schulz’s Peanuts debuted as what is arguably the most important comic strip of all time in 1950. 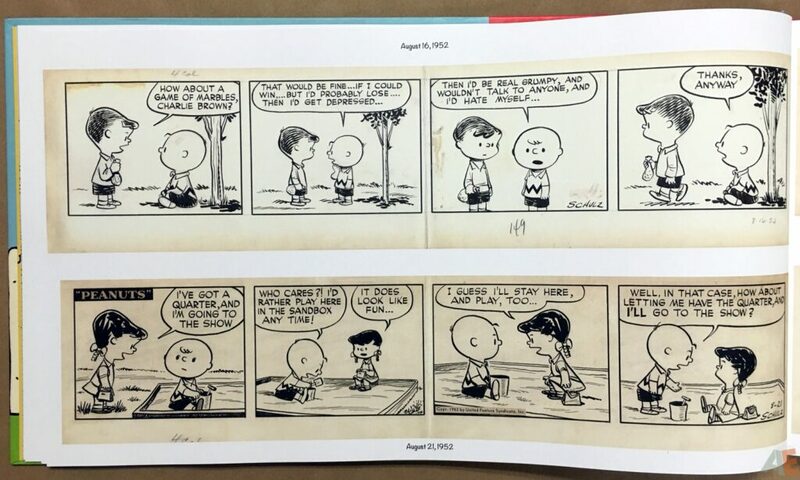 Peanuts transcended the medium, presenting complex issues and moral dilemmas in the space of four panels, while maintaining a bitingly funny sense of humor. Charlie Brown, Lucy Van Pelt, Linus, Schroeder, kite eating tree, the Great Pumpkin, and, of course, Snoopy… all are embedded in our psyches. 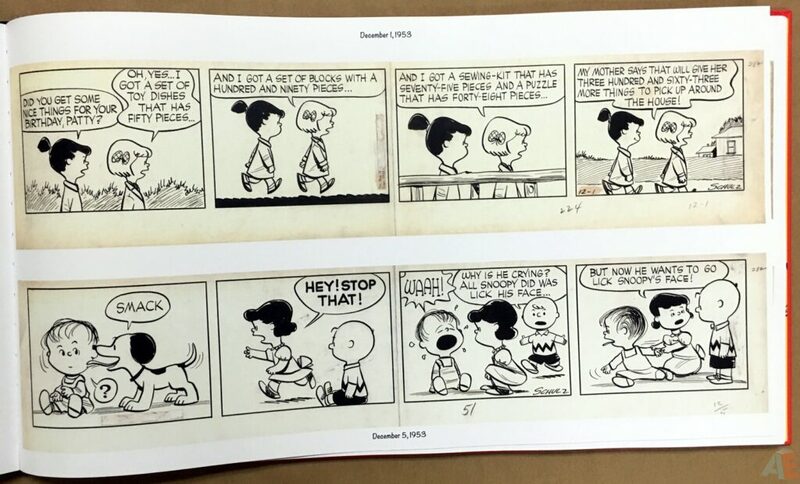 Now, for the first time, Schulz’s classic creation will be seen in a way as close as possible to the original art created by the artist himself-in IDW’s multi-award-winning Artist’s Edition format, with each strip being carefully scanned and reproduced. 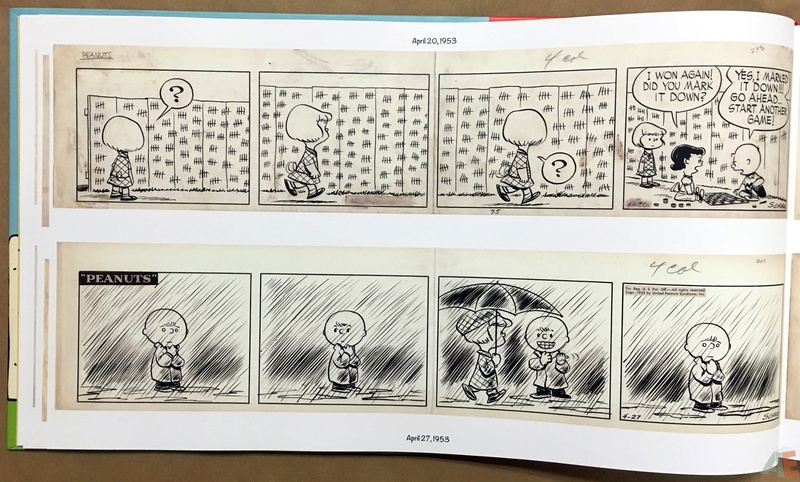 Note: Because of the enormous size Charles Schulz worked, these originals will be reduced in size from the original art. A lot of unique features in this Artist’s Edition. The only horizontal edition, measuring 20″ x 13″. 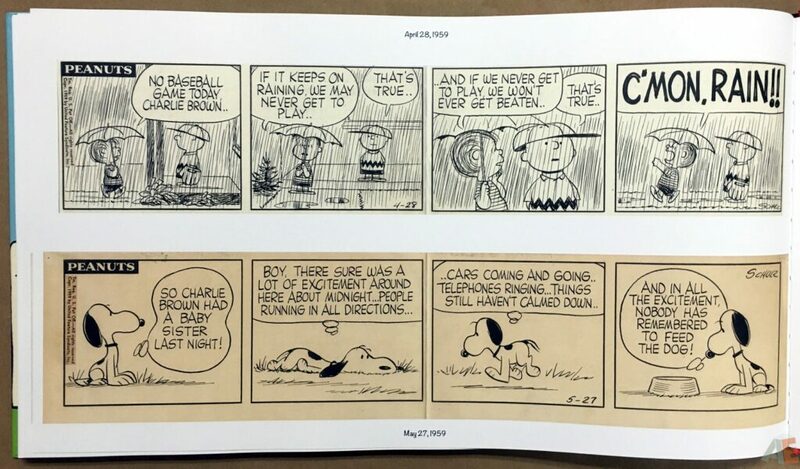 The only complete newspaper strip edition; Tor contains some strips but you have to turn the book sideways to read them. 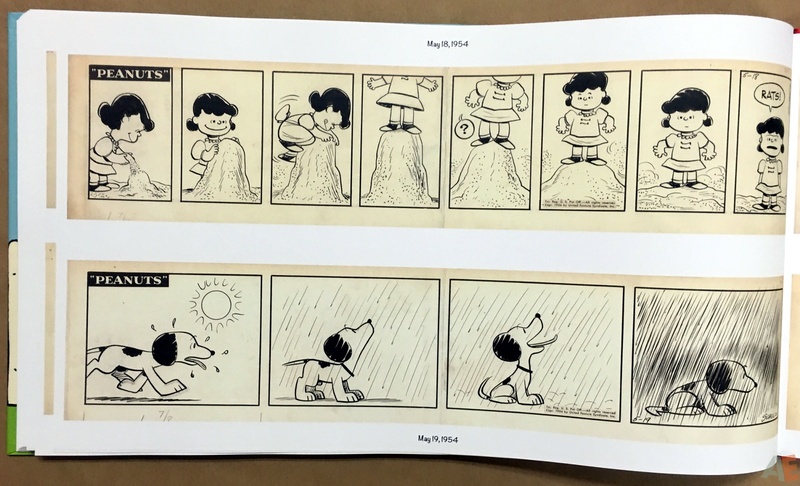 The only non-sequential original art edition to be called an Artist’s Edition and not an Artifact Edition. 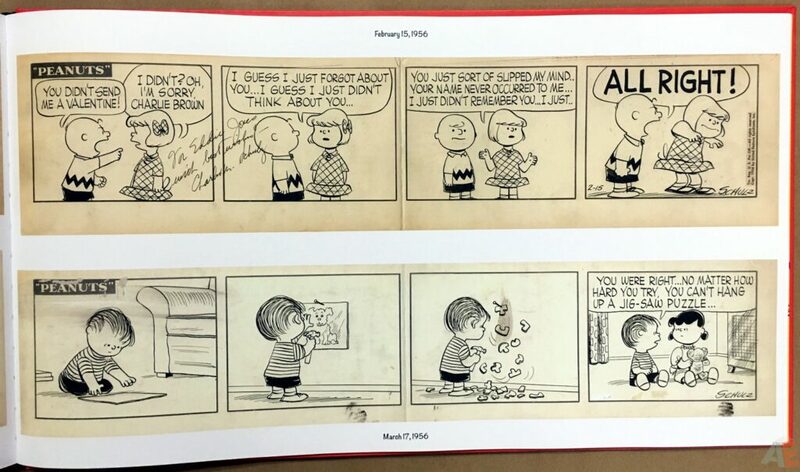 And the only Artist’s Edition to reduce the original art. 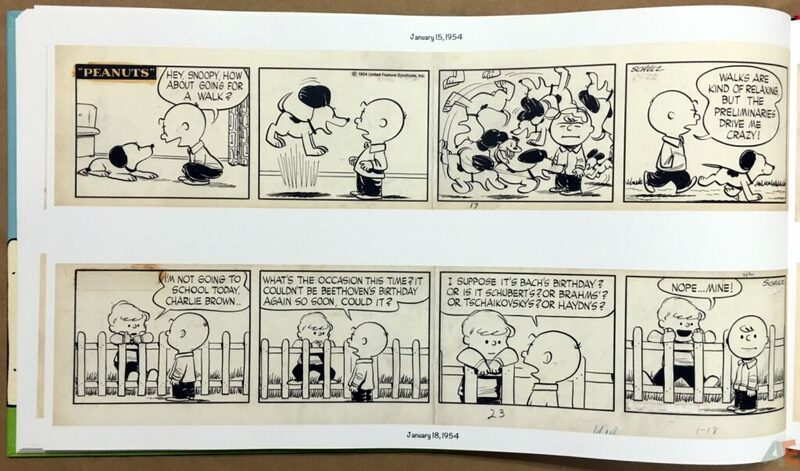 For this period of 1950-1960 original art was 26.5-27.25″ x 5-5.5″, based on information available from past auctions of material from this selected decade. 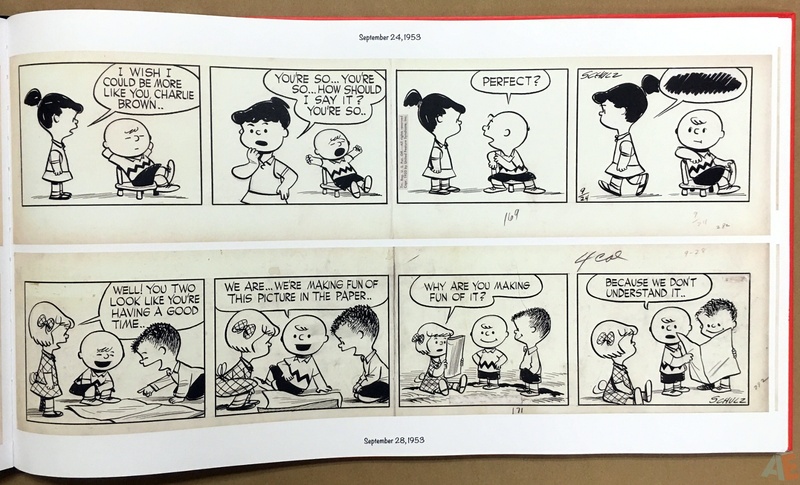 The strips in the book are 18.5-19″ x 3.8-4.4″, so it’s a significant size reduction. 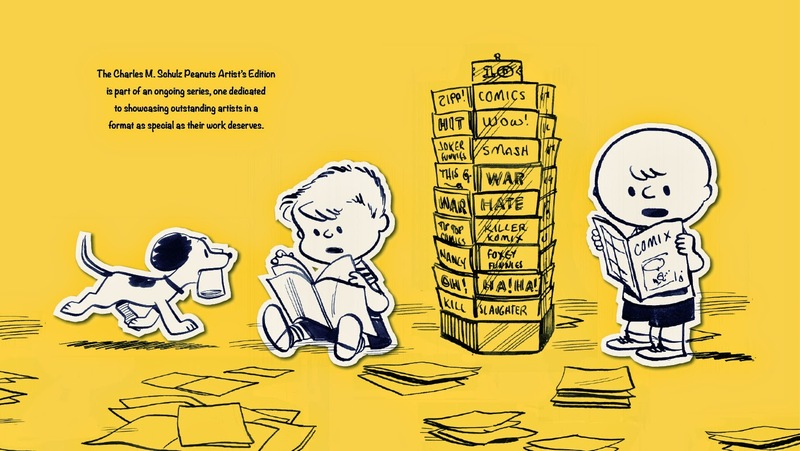 I was surprised to see no mention of this reduction in the book’s introductory pages; it only appeared in the initial solicitation and isn’t on the IDW site. Scans are clear and crisp throughout. 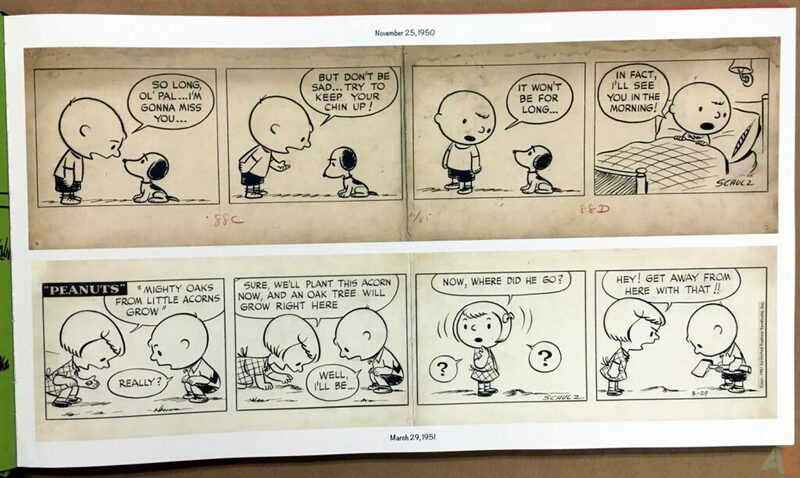 From the notes in the indices “All of the original art came from the collection of the Charles M. Schulz Museum in Santa Rosa, California“. Most likely that involved only one person scanning everything collected here. No art corrections here; Schulz must have cleaned things up in pencil and then inked cleanly. There are the occasional dialogue paste ins. 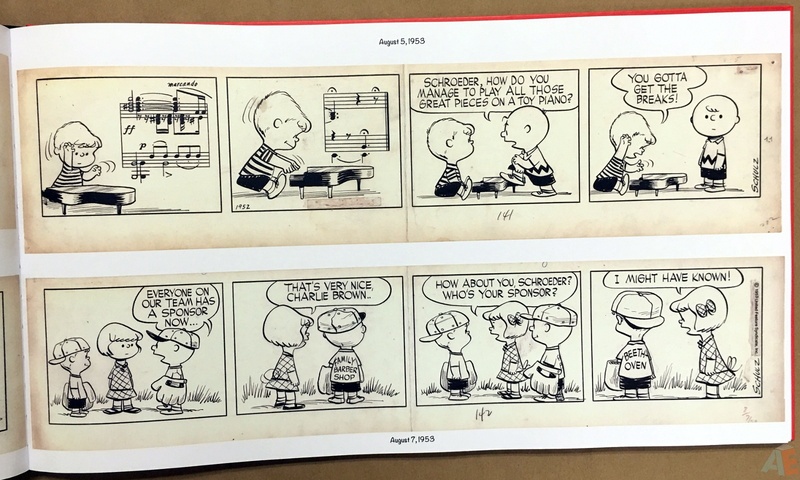 Every strip was folded in the middle, possibly for mailing or storage. 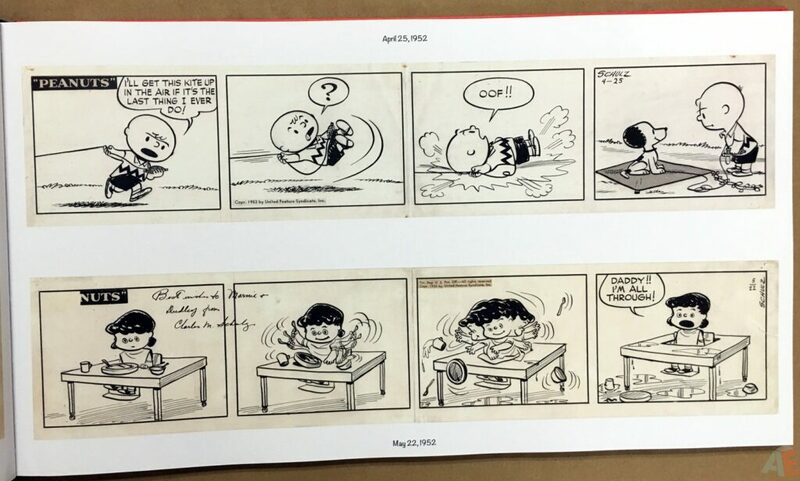 A few strips have handwritten notes to people Schulz must have gifted strips to. 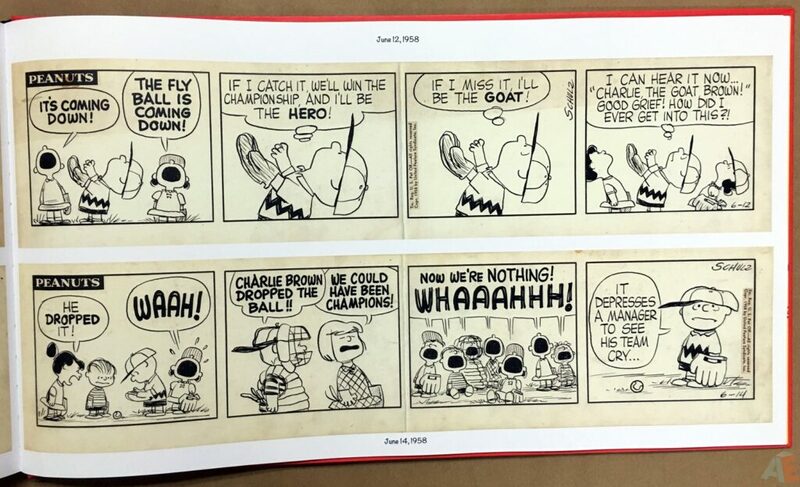 The pages have aged well, ranging from mostly off-white to the odd brown. 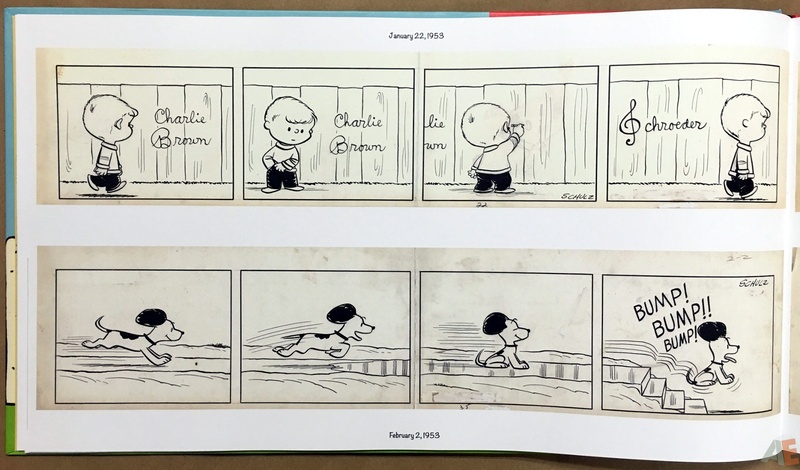 No extras or gallery is included: the book moves through the strips by date and ends with a one page biography. 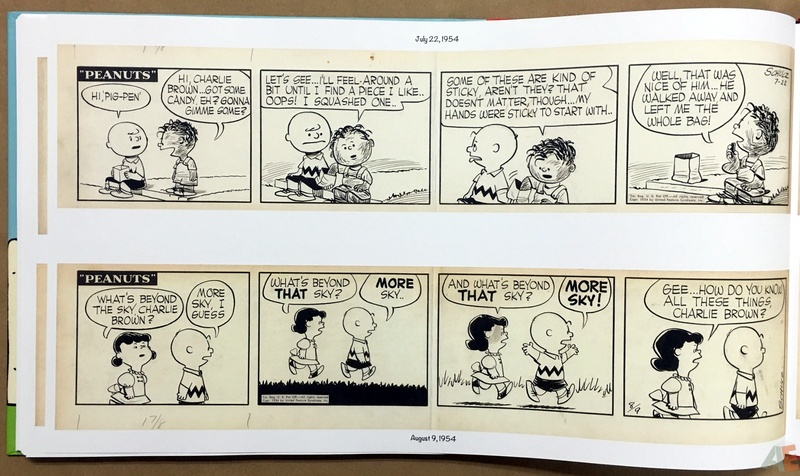 Each strip has it’s date printed either above or below, depending on placement. Randall Dahlk’s design is clever and appealing. With no extras or chapter dividers the only colour we have are the opening and closing, and Dahlk uses the four colours from the cover for each page spread. 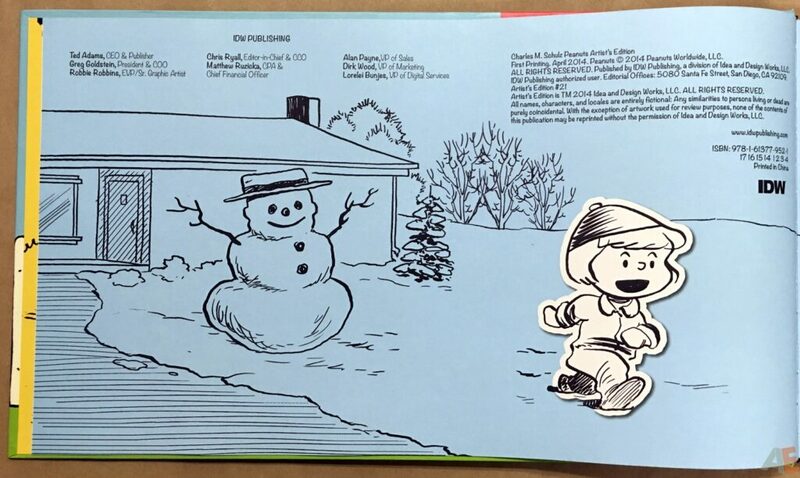 The characters are white cut outs, moving from the cover on through to each page. Schulz’s comic rack is easy to miss in the strip but the titles on it and his take on what mainstream comic books offered is clear, and Dahlk features it front and center. 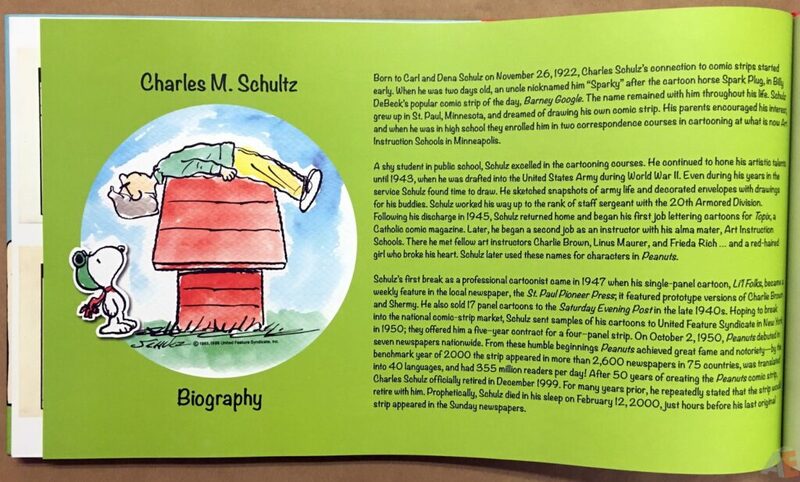 Production is good and sturdy, with sewn binding holding thick and heavy paper stock. 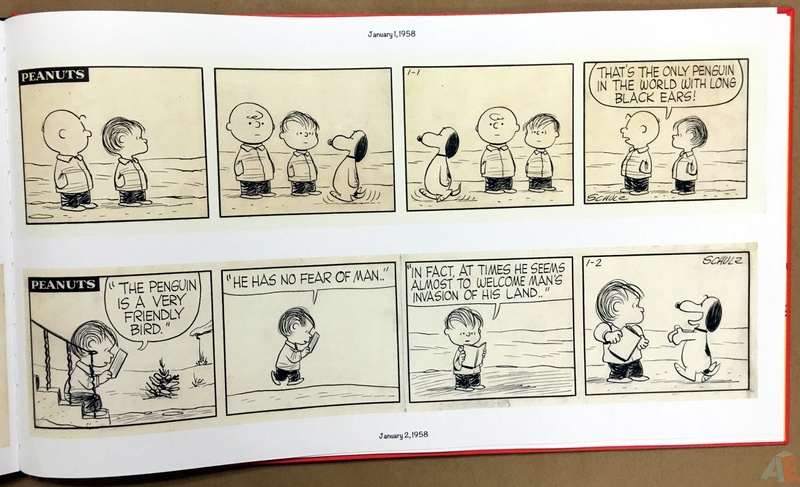 The book comes shrinkwrapped in a cardboard case with a black and white sticker showing art and UPC code. This may be the only instance the book’s cover wasn’t on the case sticker. 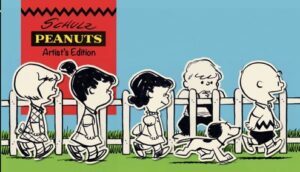 As well the spine and indices give the title as Charles M. Schulz Peanuts Artist’s Edition but the cover and case sticker use only the last name.